Dr Ajay Thapar worked as a GP in Cardiff and other localities in the UK until last year. He then travelled to the United States on a travel fellowship awarded by the Winston Churchill Memorial Trust to learn more about the diagnosis and treatment of sleep disorders. He met leading clinical sleep experts on various types of sleep problems at universities in and around San Francisco. We caught up with Ajay to find out what he learnt and get some top tips to ensure you get as good a night’s sleep as possible. When do a few nights of poor sleep become insomnia? A sleep problem can be defined as insomnia when, your sleep pattern is regularly disrupted and instead you may lie awake for long periods, wake several times or wake up too early. This would be accompanied by issues during the day, such as feeling tired or having difficulty concentrating on tasks or feeling irritable. If this sounds familiar, and you experience it for at least 30 minutes, at least three times a week for at least three months, this is defined as insomnia (but probably better termed “chronic insomnia”). However if you feel that recurrent problems with poor sleep are causing you daytime problems you should seek help whatever. There are many different types of insomnia and insomnia is surprisingly common. One in three people have short-term (“transient”) insomnia whilst one in ten have long-term (“chronic”) insomnia. Transient insomnia affects someone for days or weeks, but chronic insomnia may take place over months or even years. Insomnia is also sometimes defined by whether another problems may have caused the insomnia. For primary insomnia no other problem is thought to have caused the insomnia whereas for secondary insomnia another problem e.g. other medical conditions, some prescribed and over the counter medication and some lifestyle factors e.g. substance abuse. Ajay explained, “The distinction between primary and secondary insomnia is often however very difficult. Some factors (e.g. genetic factors) may be the same for individuals labelled with primary and secondary insomnia. Currently most cases of chronic insomnia are labelled as secondary. However research is finding that in many cases for secondary insomnia there are often bidirectional links between, or a common underlying factor (e.g. lifestyle, genes) for, a health problem and insomnia. For example, initially sleep problems were thought to result from being depressed. Then research suggested that insomnia could also cause the depression. More recently it is clear that the relationship between sleep and depression is often two way with very recent research suggesting that there could also be common causes (e.g. genes). Environmental factors are well established as being associated with insomnia, such as life changes, including long-lasting stress and emotional upset, and travel or work schedules that disrupt your sleep routine. 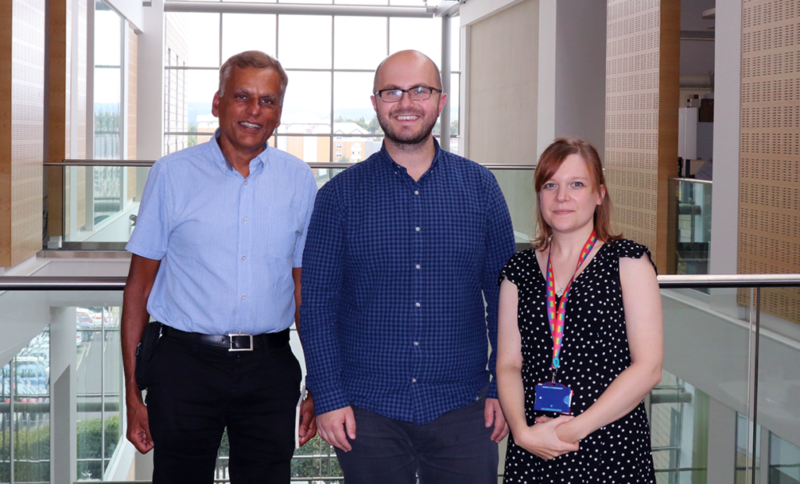 When speaking about making an accurate diagnosis of insomnia, Ajay explains that the key to diagnosis is a careful, comprehensive clinical history including family history, exact symptoms and a history of when the problem originated and what was going on at the time e.g. other health problems, severe psychological stress. Three key factors affect sleep, these can often help to clearly map sleep problems. Some people are “evening” people whilst others are “morning” people, who naturally feel more awake at different parts of the day. Some naturally sleep later than others and feel ready to go to bed later, and vice versa. These circadian rhythms can be disrupted by illness and age. This relates to hours spent awake and previous sleep disruption. There is a large variation between individuals and the amount of sleep needed varies from person to person. Traumatic life events or stress can affect our sleep pattern and processes, as can activities like consumption of caffeine or other drugs. Again, using a sleep diary can help illustrate how these environmental factors may be related to these three processes. CBT-I should be first-line therapy for most types of insomnia. There are multiple components to this approach; the key elements, however focus on certain behaviours. Sleep restriction – having a fixed wake-up time and limiting time in bed to the number of hours that you are actually asleep (from your sleep diary but minimum of 5 hours however). This will increase the sleep drive and should improve sleep efficiency (time actually asleep as a proportion of time in bed). You can then slowly increase the time in bed until your sleep efficiency drops. Cognitive restructuring, also known as cognitive reframing, is a technique drawn from cognitive therapy that can help people identify, challenge and alter stress-inducing thought patterns and beliefs. Sleep hygiene is another component of many CBT-I interventions. Maintaining good sleep hygiene means practising habits conducive to sleep. 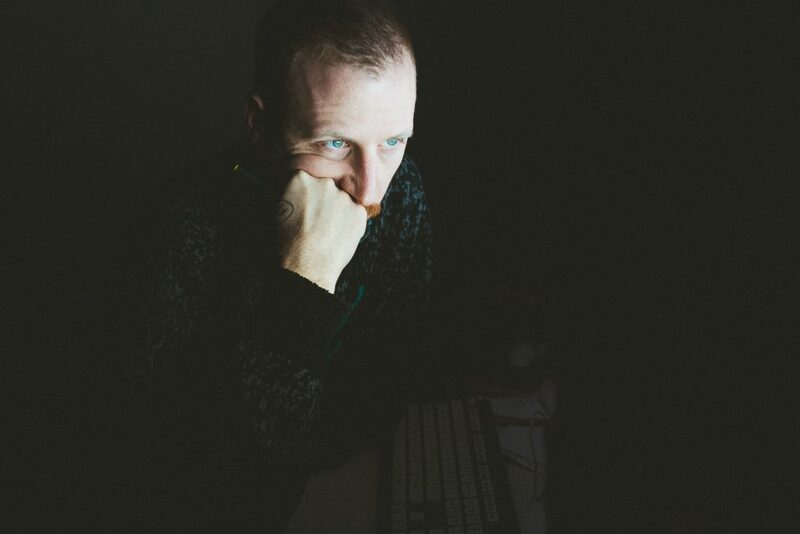 “Although sleep hygiene has often not been found to be helpful if used alone to help sleep it can be valuable if used with other components of CBT-I”. Ideally professional assistance is needed to help someone over a long-term sleep problem. However recently many CBTI-based apps have been devised to help people sleep better. Some recent results from studies indicate using these alone may be as effective as face-to-face therapist treatment for some people. Ajay’s view is that however that for most people these are likely to be more effective if there is some third-party involvement -although a health professional may be preferable it could be someone from a wider range of care providers or organisers who could monitor and advise with a small amount of training. Ajay reiterated the importance of a careful clinician history to see when problems arose relative to one another. If the onset of sleep problems coincided with the onset of mental health problems it may be appropriate to proceed just with specific treatment for mental health problems initially. For individuals with insomnia and mental health problems which arose at very different times, both problems may need separate treatments. Low dose antidepressants may be effective for some people with sleep problems with subthreshold mental health conditions but this would need to be discussed with your GP. Melatonin is a hormone that regulates sleep and wakefulness. Melatonin can be helpful for some people with disrupted circadian rhythms e.g. if you get severe jet lag or in the elderly with middle of the night insomnia or early morning wakening (can be prescribed by your GP for this group as it is included in NICE guidance) and some children with neurodevelopmental disorders e.g. ADHD (you may need to see a specialist to get a prescription for this). This condition is often missed. If you have excessive daytime sleepiness and especially if you are a snorer, your partner notices you stop breathing at times during the night or you wake up with a dry mouth/headache and you are overweight in middle age you may have sleep apnoea. Sleep apnoea also seem to be commoner in children with neurodevelopmental disorders (again showing the large number of links between “brain” and “body” conditions). If worried that you have this you should see your doctor. Preventative measures for adolescents if at high risk for insomnia and poor mental health. For younger adolescents, a mixture of CBT-I and encouraging positive ruminations may have a preventative role for sleep and mental health outcomes. Positive ruminations encourage the child to focus on past successes rather than negative thoughts and worries, which can be common in those with anxiety in this age group. Older adolescents have been shown to benefit from a mixture of CBT-I and support from their peers. A very basic mindfulness/controlled breathing/yoga therapeutic approach may have particular value in treating sleep problems in children with neurodevelopmental disorders and may also help individuals with chronic pain. In Ajay’s view there is, however, at present, limited scientific evidence to support this. You may have picked up on the fact that sleep diaries are pretty important in helping to discover issues you may be having with your sleep. 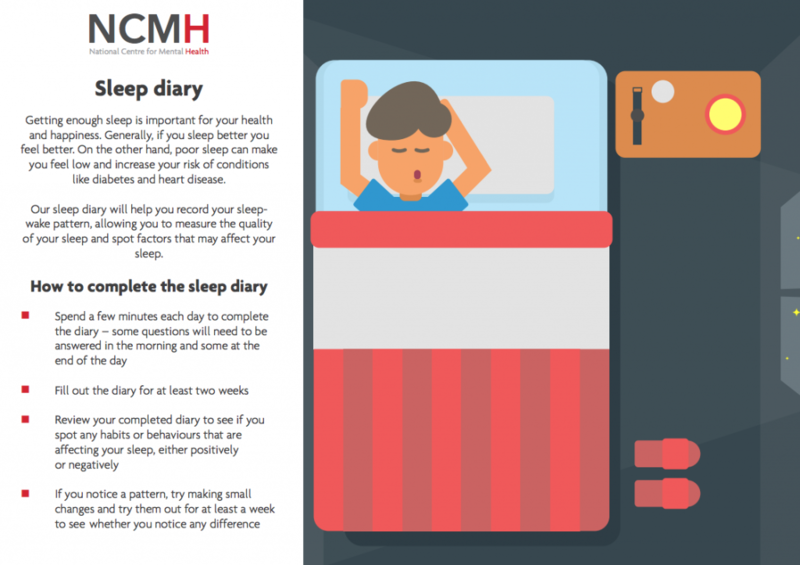 If you haven’t already checked it out you can download the NCMH sleep diary for free. To stay up-to-date with our events and any new resources that become available follow us on Facebook and Twitter. Charlie is a Communications Officer in the Division of Psychological Medicine and Clinical Neurosciences at Cardiff University.